I have known John Hill, one of the most well-recognized and influential figures in the areas of Warehouse Management Systems, automatic data collection, and supply chain execution, for about than 20 years - though I have no memory of when and where we first met. Does Hill have any regrets? Not many, but one was related to an idea he and Dave Scott had for a new kind of WMS that never made it to market. So I thought it might be fun to do it again here in 2015, and both Hill and I enjoyed the effort. For those that don't know, Hill is currently a consultant at St Onge, and has had a great career, perhaps most notably as CEO of a company called Logisticon, which was one of the earliest WMS companies and which ultimately produced many people who played prominent roles in WMS after Logisticon closed under some very unusual conditions (more on that someday) that had nothing to do with Hill. He and a small group of folks - notably the late Dave Scott - ran a small consulting firm called Cyprus for many years through and beyond the 1990s that had influence in the market well beyond its size. He was a fixture giving conference presentations for years, to the point many assumed he was running a very large consulting firm. He has been highly involved and influential in the MHI organization (the former Material Handling Institute) and automatic identification group AIM, and indeed is a chart member of a group called the AIDC 100. There is quite a bit more, but hopefully that gives enough of a flavor. So here today are some highlights of our recent interview, this time a much longer one than in 2003. You will find the full transcript in next week's OnTarget newsletter. I started by asking Hill what has really changed in the WMS/SCE market since our first interview in 2003. "You know, it's hard for me to say "back in 2003." But you look and say it's been 12 years," he said. Noticeable then, he said, were the early signs of significant WMS sector market consolidation. "As you know, that consolidation has continued on for the last 12 years. In fact, only one tier 1 provider [Manhattan Associates] from the old days really remains today," Hill noted. "Remember when we used to talk about there being more than 100 WMS providers, maybe even over 200 at one point? Some of them are still out there somewhere today, but the ranks have been thinned remarkably." I noted that back in the heyday of a trade show called Distribution/Computer Expo, there would just be aisle after aisle of WMS vendors, and remember talking to some attendees back then in the 1990s that told me that after visiting about 10 or 12 booths, their heads would start to spin and they would just turn around and go home. We naturally discussed how most WMS vendors have long ago moved outside the four walls of the DC, and now beyond even applications like TMS and yard management to Distributed Order Management, supply chain visibility, even supply chain planning. So how do we categorize these types of vendors now? Hill says he has coined a new term and acronym: Enterprise Supply Chain Management, or ESCM, to provide a new category for these hybrid vendors. Alas, the term not surprisingly has been used already, at minimum by the old Peoplesoft before it was acquired by Oracle, so his idea of copyrighting it and making a living off the royalties seems unlikely. But ESCM is certainly not in common parlance. I like it, and may just start using it - royalty free - here on SCDigest. One thing I definitely want to cover is why WMS implementations today often remain difficult and painful - much more so than I think either of us would have predicted back in 2003. Why is this so? Hill says changes in WMS vendor practices are a key factor. "As the WMS market has grown and matured, I think frankly that the level of talent on the WMS vendors' front lines has diminished," Hill said. "And a number of them are subcontracting implementation to third parties. There are some good third parties out there, but some of them don't know a warehouse from an outhouse." He believes WMS vendors need to up their games in terms of who they hire and how they train them for these deployments. "You need people who understand distribution, not just how to configure the WMS product. And that includes the front end, the salesforce, who I think need to have stronger knowledge of both distribution and the product they are selling." He added. "I've received some sale pitches over the past few years where you wonder if they've ever even walked a warehouse." But WMS customers often don't help themselves either, Hill believes. "In my experience, supply chain projects failed when users didn't fully do their homework, or skipped important steps in the process, whether its failing to well define workflows and processes, performance goals, all the needed capabilities, etc.," he says. "But even when they've done all that, some companies still don't well connect all those requirement to what's in the different WMS packages they are evaluating. It's hard work, but it has to be done correctly, and if it's not it can lead to the kind of deployment pain you referenced." In October 2003, RFID was ready take off, with the EPCglobal organization just forming, the Walmart tagging mandate announcement, and RFID climbing to almost mania conditions. We discussed that back in that first interview. Then, the Walmart program imploded just a few years later, and the momentum for RFID in distribution collapsed with it, especially in the US. What happened, and will that change someday soon? "The Walmart announcement was a watershed event, and cost a number of companies a lot of money in terms of preparing for those mandates," Hill said. "What we wound up with unfortunately were cost and performance issues that I might compare to "square peg-round hole." The technology was not ready at a price point that could be cost justified for the applications Walmart was trying to pursue," leading to the program's demise. But the Walmart mandate did lead to huge investments in RFID technology, even though many venture capital firms lost their shirts in the end, and the technology today is far superior to what it would have been otherwise, Hill said. While he believes RFID likely will be used more extensively in distribution than is the case today, it will be used in combination with other related technologies, including bar coding, Voice, smart glasses and more, rarely as the only such technology in a DC. Hill said the concept was for a program into which "a user could input data on current and projected warehouse activity and product mix and volumes, equipment and human resources, and out of the program would pop out alternatives for changing the physical layout of the DC and how to deploy staff to optimize performance." Next, he said, the program would automatically generate and configure a WMS to execute that plan and manage performance. It would do the same as activity profiles and business conditions changed over time - a sort of "magic WMS" you might call it. "We got pretty far with that concept - but then we ran out of money," Hill said. "But someday, I think someone is going to do it, bring such a WMS to the market." There is one other problem - Hill has no idea where the source code or documentation is today. "Maybe in a safety deposit box in Jackson Hole," he says. Then finally the most important question - is he ever going to retire? "My golf game is no longer good enough to do that - and I'm still having too much fun in "our world" to leave it!" he said. Good guy. Good stuff. Full transcript with much more next week in OnTarget. 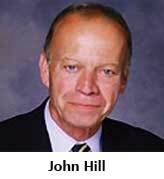 Any reaction to John Hill's comments? Do you know John? Let us know your thoughts at the Feedback button or section below. Great article on John Hill. We have all learned from his contribution over the years. John, Keep up the great work. Great article on the best person I've ever known in the business. Also, John's golf game is better than mine, so I guess we're both in it for the long haul! I met John back in the early 90s. He has always been a consumate professional and on top of his game understanding WMS systems.